We're sipping a mango margarita and diving into how we are - and aren't - documenting family memories. Plus we talk about how we decide what sentimental items to hold on to and what to let go of. Rub the rim of each glass with a lime wedge and dip into chile lime salt. Fill each glass about half way with ice and then split the mango lemonade, tequila and lime juice between the glasses. Stir and garnish with a lime wedge. 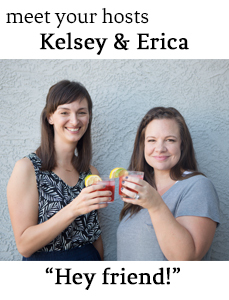 In the episode, Kelsey shares her system of using Google Photos to back up her iPhone photos, Google Photo Albums to group photos and Blurb to create yearly family albums. Erica is all ears. + Once photos are backed up to Google Photos I delete all photos phone - feels so good! + In Google Photos on my laptop I go through the photos I recently uploaded and select all the photos I want to include in our yearly family photo book and then copy them to a Google Photo Album titled Team Wharton 2016. + At the end of the year when I'm ready to make a photo book I select all the photos in the Team Wharton Google Photo album and copy them to a folder on my desktop. This makes it easy to upload all the photos I want into an online photo book program, like Blurb (which I've used several times and have been really happy with). Kelsey's other photo-related tip is to use the Persnickety prints app to print different size photos including square format (Instagram photos). Erica's shares her tip for printing family photos by ordering prints as soon as you return home and buying a frame even before you take the trip. In other family memory keeping Kelsey uses a journal from Shutterfly to jot down memories about the boys and she has also loved using her Nikki McClure First 1000 Days journals for each boy. In obsessions Kelsey is obsessed with the Creative Lunch hour she established at work and Erica can't stop eating On the Border chips and salsa.